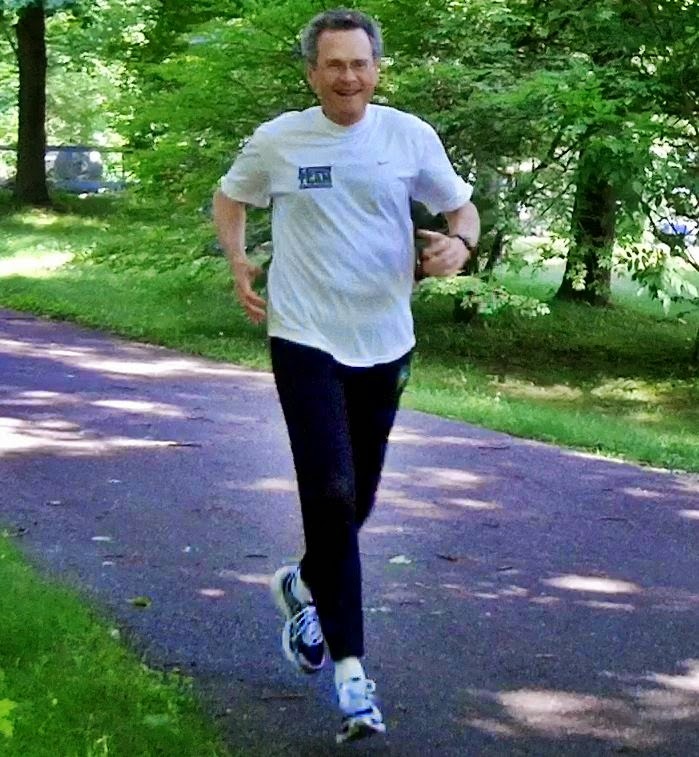 I have entered a contest by Runner's World Magazine to determine who will be on their December cover. I hope you will click here http://covercontest.runnersworld.com/entry/655/ and vote for me. You can vote every day, and that would be marvelous. The contest goes until mid-August. You can help even more by spreading the word on your own facebook or twitter page - let's make it viral! Be sure to include the magic hashtag #RWCoverContest. U. S. Senate you are disgusting, cowardly, useless, hopeless, an embarrassment to humanity. If you voted against background checks, please go home and don't come back. You are not worthy of the people's trust. Several years ago my family and I were part of a group that stayed at the Blakely New York, a Manhattan boutique hotel on 55th Street, between 6th & 7th Avenues. We were pleased then, and it was close to where I wanted to be, so I stayed there again for two nights this week. I couldn't have been treated better. My room was the "standard" size, the smallest they offer, but nevertheless had a king bed, a kitchenette, and plenty of space to walk around. The entry area, which included the bathroom and kitchenette, was all marble with a hardwood floor, and the remainder of the room was tastefully decorated. All of it was spotlessly clean. The kitchenette area lacked a stovetop (hence kitchenette, not kitchen), but did have a microwave, small refrigerator, sink, cupboards, dishes, and flatware. The work table was large, and the flat-screen TV was plenty big enough for the room. They also provided terry bathrobes, one of which I used and enjoyed. It cost $315 per night. I'm not a regular NYC hotel shopper, so I don't really know how competitive that is, but I did just a little checking around and it seemed to be in the ballpark. Best of all was the way that they treated me. I arrived Tuesday at 11:30 am, and went to the front desk expecting to be told to wait for a room. But the front desk clerk said "Oh, we'll check you right in if there is a room ready." And their was. Better yet, when it was time to go, they allowed a very late checkout, 4:00 pm, very rare in my experience. Of course a person can't count on that, but I am SO going back there if I have a chance. GE LED7PAR20/NFL, Phillips NR63R4-7W-Q100, LED8PAR20/DIM/830/NFL25, Eco-Lite 9 watt. All are NFL (narrow flood) lamps except possibly the Eco-Lite, for which the beam width is not given. All were purchased on Amazon.com. Most were $30, with the GE costing $38. All are made in china. The rated lumens are baloney. These bulbs compared reasonably well with a 50W Sylvania PAR20 Halogen NFL (narrow flood) lamp rated at 550 lumens. 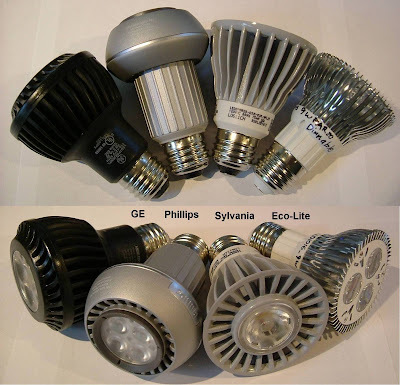 Further, there was no difference in power consumption or brightness between the GE and the Sylvania, even though there is a huge difference in rated lumens. The rated life means the hours before the brightness drops below 70% of initial brightness. Lifetime numbers for light bulbs are notoriously optimistic - you may have noticed that with CFL’s. Lifetime will depend a lot on the bulb’s local environment - how much cool air can come in contact with the bulb. "Observed brightness" is totally subjective, a 0-10 scale, where 0 is dark and 10 is the GE and the Sylvania. Comparisons were done in side-by-side tests, using two bulbs at a time, projecting on a white wall. To my eyes, the GE and Sylvania were equal in color, with the Phillips slightly yellower (warmer) (even though it is rated for a slightly bluer color temperature), and the Eco-Lite was actually bluer (cooler). Since the Eco-Lite has a somewhat wider beam than the others, it might actually be a little brighter than it seems, with the light dispersed more broadly. Similarly, the halogen bulb used for comparison also had a wider beam, and all of the LED bulbs appeared bright by comparison. The dimmer used to test the Sylvania and Eco-Lite has a detent switch for "off," and moving the lever just above "off" produces a lowest setting which causes all lamps of all kinds to light, at least a little. The Sylvania was still rather bright at the lowest dimmer setting, whereas the Eco-Lite dimmed farther, though not as smoothly. The GE and Phillips are not rated for a dimmer and were not tested. The tests were done on just one sample of each bulb. Tests on a larger number and from different manufacturing lots could give different results. The Eco-Lite bulb came with no documentation, except for a sheet of cautions saying what NOT to do, e.g. do not eat the bulb while it is plugged in, etc. No product information. There is no product information at all printed on the bulb. Absence of a UL symbol means it is not UL Listed, thus not tested for possible shock or fire hazards. It’s about the same price as the others, so it would be my last choice among the bulbs. The Sylvania and the Eco-Lite are maybe a half inch shorter than the other two. I have used several of the GE bulbs for over a year now, and they have performed flawlessly. However, they are the most expensive. The Sylvania bulbs are lower in cost, dimmable, and smaller, so they are my choice now. Actual current, power, and VA (volts * amps) were measured on a "Kill-A-Watt" brand in-line power meter, a handy device but not a precision instrument, though I believe it gives good enough numbers for this purpose. Further, the line voltage was 113V, not the rated 120V. However, the same instrument and voltage were used for all bulbs. According to that meter, each of the lamps actually consumed about 5 watts except the Eco-Lite, which consumed 8 watts. Also, surprisingly, the current drawn by the Eco-Lite is at least twice that of any other bulb. That does not translate into consumed power, though, because of something called the "power factor.” You are billed for the watts, not the current or the volt-amps. Fresh idea 1: President Obama's Birth Certificate does not exist. "Just wait," he promised, only to be embarrassed when the document was finally made public. Of course there was never any doubt where Barack Obama was born, with contemporaneus newspaper announcements, eyewitness accounts, and certification in accordance with the laws of the State of Hawaii, which together would satisfy any court in the nation. Trump knew that, but made so much self-promoting racket anyway, that the President asked the State of Hawaii to make an exception and provide certified copies of his original certificate of live birth. Big deal - those who don't WANT to believe it will still not believe it. Trump knew the facts and deliberately misled us all. Fresh idea 2: Threaten to tax imports from China 25% if they continue to manipulate their currency. Oh, that sounds so fine! It will not happen, of course, because you do not want to pay 25% more for your next flat screen TV or HP laptop, and the US companies that make those products in China would never stand for it. Further, China would retaliate by imposing punitive tariffs on selected imports like machinery, generators, airplanes, medical equipment, and more, making equivalent products from other countries preferable in China. It's called a trade war. Those companies would squawk so loud that Congress would intervene. Trump knows this, so again he deliberately misleads us, promising what he couldn't possibly deliver. Obviously, Donald Trump thinks we're stupid. Some people are, and they will be taken in, but I'm just disappointed.